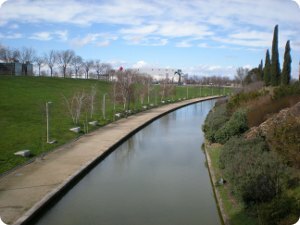 Juan Carlos I Park is the main municipal park. 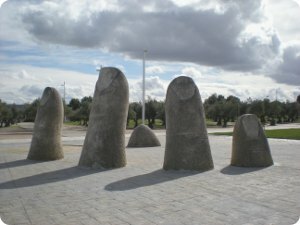 It was inaugurated on the occasion of "Madrid Capital of Culture" in 1992. His name is in honor to Juan Carlos I (King of Spain). With the Park was recovered a highly degraded area, respecting an existing olive trees. It occupies an extension of 160 hectares and has a lake of 30,000 m2, a river of 1,900 m. to length, 13,000 m. of walks, 21 hectares of olive groves, 19 outdoor modern sculptures, a garden called the Three Cultures ("Tres Culturas"), and an auditorium. There are many different activities you can do in the park. They have a free bicycle service and excursions in mountain bike. There is also a little tourist train for travel around the park during the whole year, activities and workshops for kids, canoeing courses, fishing without death and things for the whole family. A beautiful and huge park in which to enjoy a perfect family day. During the weekends, many families come to the park for a picnic. There are picnic tables, or in the grass at the river bank. The Music MetroRock festival is regularly held at the Juan Carlos I park. Jun to Sep: Fridays and Saturdays: 7:00 to 3:00 h. Rest of the week: 7:00 to 1:00 h.
Oct to May: Fridays and Saturdays: 7:00 to 0:00 h. Rest of the week: 7:00 to 23:00 h.
* Line 8 - Campo de las Naciones station. * Line 5 - El Capricho station.